Just about every packaged food made in the U.S. has a food label indicating serving size and other nutritional information. Learning how to read food labels is like looking at a prescription for your health and your life. We recommend looking for red-flag ingredients- if a Hall of Shame ingredient is listed among the top five ingredients overall, steer clear! Just about every packaged food made in the U.S. has a food label indicating serving size and other nutritional information. The "Nutrition Facts" food labels are intended to give you information about the specific packaged food in question. Measurements of fat, cholesterol, sodium, carbohydrate, protein, vitamins and minerals are calculated for a "typical portion." But, reading these labels can be confusing. Below are some explanations of its components. Serving Size. Serving sizes are based on the amount of food people typically eat, which makes them realistic and easy to compare to similar foods. This may or may not be the serving amount you normally eat. It is important that you pay attention to the serving size, including the number of servings in the package and compare it to how much you actually eat. The size of the serving on the food package influences all the nutrient amounts listed on the top part of the label. For example, if a package has 4 servings and you eat the entire package, you quadruple the calories, fat, etc. that you have eaten. Calories and Calories From Fat. The number of calories and grams of nutrients are provided for the stated serving size. This is the part of the food label where you will find the amount of fat per serving. Nutrients. This section lists the daily amount of each nutrient in the food package. These daily values are the reference numbers that are set by the government and are based on current nutrition recommendations. Some labels list daily values for both 2,000 and 2,500 calorie diets. "% Daily Value" shows how a food fits into a 2,000 calorie/day diet. For diets other than 2,000 calories, divide by 2,000 to determine the % Daily Value for nutrients. For example, if you are following a 1,500 calorie diet, your % Daily Value goal will be based on 75% for each nutrient, not 100%. For fat, saturated fat and cholesterol, choose foods with a low % Daily Value. For total carbohydrates, dietary fiber, vitamins and minerals, try to reach your goal for each nutrient. Ingredients. Each product should list the ingredients on the label. They are listed from largest to smallest amount (by weight). This means a food contains the largest amount of the first ingredient and the smallest amount of the last ingredient. Label Claim. Another aspect of food labeling is label claims. 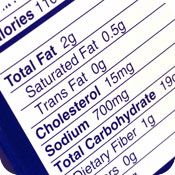 Some food labels make claims such as "low cholesterol" or "low fat." These claims can only be used if a food meets strict government definitions. Receive first two sessions of i-Lipo for only $99. Limited time offer! "If it wasn’t for Chiropractic care I wouldn’t be walking today; I would be in a wheelchair. It isn’t an instant fix, it takes time, but it works. I spent every year in the hospital for the first five years after a back injury that was back in 1978. I am still coming back for treatments to maintain my health and to keep my physical balance with life."